The Musings of Major_Grooves: So what is it I'm doing now exactly? So what is it I'm doing now exactly? I'd been wanting to start some kind of company for a while, particularly something involving Internet technology, but that idea was limited by my lack of programming skillz. My day job had given me experience of project managing the re-design and re-launch of a pretty complicated business information website/database so I was quite confident I could find my calling in the Web start-up world coming from the business angle. It was a toss-up between trying to start-up a company and doing an MBA this year. And the start-up won. Earlier this year I teamed up with Jennie Lees to start Affect Labs. The company is founded on sentiment analysis technology that Jennie had developed during her doctoral studies at Cambridge University. She has since moved to Scotland and the company is now established in Edinburgh. Over the past few months we've been writing business plans, applying for funding and lots of other cool things. While this has been full-time for Jennie for some time, for me it has always had to be something I fitted in to my spare time and holidays. It also wasn't something I widely revealed at my day-job. Well, the time has come where I need to apply more time to the start-up. We're starting to try to raise money in earnest and that means more work and meetings. There's only so many meetings I can arrange for holidays! So, I have told my employer my plans and they have very graciously agreed that I can go part-time from September. Eventually I hope to go full-time with the start-up, but only time will tell when we'll be in a position to allow that. So the exciting news is that we've launched our first product. FestBuzz (with funding from 4iP) is crowd-sourcing Edinburgh Festival show reviews. What that means is that our technology is listening out for all the messages on Twitter that are talking about the Festival shows. We aggregate these messages (aka "tweets") and use our sentiment analysis technology to understand the emotion in the reviews - are people being positive or negative about the show. The site launched late last week, and is not quite yet 100% operational. We've got a few features to switch on and we're waiting for the Festival to really kick off so the flow of tweets will start. So if you're interested in getting started with Twitter and "tweeting" your reviews, have a look at this guide (or this much shorter one). 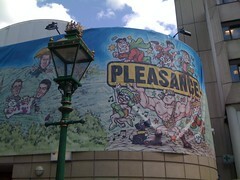 Or if you just want Edinburgh Festival recommendations from the "word on the tweet" please check out the site!